Reminder that this month's Virtual Tasting will take place on Monday November 23rd. Read about it here. Desert Wind Winery is located in Prosser, Washington. Visible from Highway 82, the winery was established in 2001 by the Fries and Jenkins families. 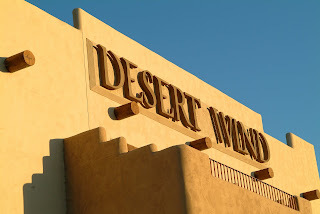 Built at a cost of $3.5 million, Desert Wind’s facilities are grand by Washington standards with a Southwest-inspired tasting room, a banquet room, an on-site restaurant, a demonstration kitchen, and a Bed and Breakfast. The 34,000 square foot facility was completed in 2006. Greg Fries, a UC Davis graduate, serves as head winemaker. Desert Wind’s wines are consistently well-priced and offer a high Quality-to-Price (QPR) ratio. The winery produces Cabernet Sauvignon, Merlot, Syrah, Barbera, Riesling, Semillon, Viognier, Chardonnay, and a Bordeaux-style blend called Ruah (Hebrew for spirit). This year, the winery has also added a Sangiovese to the lineup. Annual production is approximately 25,000 cases with capacity for up to 200,000. All Desert Wind wines use fruit from their estate vineyards, Desert Wind and Sacagawea. Desert Wind, which is named after the surrounding climatic winds, is located next to Saddle Mountain in the Wahluke Slope AVA. The vineyard was planted in 1993 and encompasses 540 acres. The Sacagawea vineyard is 60 acres in size. The wines sampled here continue Desert Wind’s tradition of quality and value. The winery’s signature wine, the Ruah, while increasing in price from $15 to $20 in the previous vintage, still offers a lot of wine for the money and can frequently be found on-sale. The only disappointment in the lineup was the Sangiovese. This was Desert Wind’s first year making this wine and, while it shows some promise, it seems a bit thin at times. Dusty earth along with pepper, red fruit and mocha aromas. Round and generous on the palate with a heaping of red fruit. A bit tart at times, especially on the back end. The Cabernet Franc comes through more than you would expect given the percentage. 48% Merlot, 36% Cabernet, 16% Cabernet Franc (Desert Wind Vineyard).Aged in French and American oak. Recommend an additional 3-6 months of age. 14.5% alcohol. 6,875 cases produced. Recommended. Fairly light in color. A fascinating nose that initially shows a fair amount of chocolate that quickly dissipates and is replaced by cranberry and candied orange peel. The taste is full along the edges and middle with a slightly weak mid-layer in between. An intriguing texture that coats the palate lightly with oak and hangs. Oak gets a little heavy handed at times. 94% Barbera, 5% Cabernet, 1% Merlot (94% Sacagawea, 6% Desert Wind vineyard). Aged in 100% American oak. 13.0% alcohol. 917 cases produced. Recommended. Just a tinge of color. Ripe white peaches, a touch of hay, and mineral on a promising nose. The taste is clean and enjoyable but shows a fair amount of alcohol at times. 100% Viognier (Desert Wind Vineyard). Aged in 97% stainless steel, 3% barrel fermentation. No malolactic fermentation. 15% alcohol. 512 cases produced. Desert Wind Winery Sangiovese Wahluke Slope 2007 $18 Rating:. Extremely light in color. Quiet on the nose with light red currant, earth, and hints of flowers. A surprising amount of fruit on the palate given the color. Unfortunately, the fruit doesn’t carry completely across the palate thinning out about 1/3 of the way through. The right food might help fill out some of the missing pieces. 85% Sangiovese, 14% Cabernet, 1% Merlot (85% Sacagawea and 15% Desert Wind vineyards). Aged in 95% French and 5% American oak. 13% alcohol. 485 cases produced.